So there it was in my in box, because I am the pastor, and I get these sorts of things. It was a slight little volume from Ken Ham, the founder of Answers in Genesis, a free gift to me. I assumed that pretty much every pastor in America must have gotten one, because it ain't like my sweet small church is particularly well known. That turned out to be right. 266,000 copies, mailed out to churches in America. That's a whole lot of printing and postage. Answers in Genesis, in the event you don't know it, is a Young Earth Creationist outfit, the folks who brought us the Creation Museum and that great big ol' reconstruction of the Ark. The book's claimed purpose is simple: to reconnect Americans with the message of Jesus. It operates from the premise that America is an increasingly secularizing nation, a premise that is objectively and empirically true. To get to that starting premise, Ham cites research that supports conclusions that pretty much every strain of Christian has also discovered. In a society where Christianity and the broader biblical narrative are no longer a given, traditional strategies for conveying the message of Jesus are no longer viable. We can no longer rely on the culture to automatically yield church going folk. Oddly enough, up until this point, I was pretty much there with Ken. He's not wrong. Then, to set the stage for his plan for evangelizing America, Ham sets out what he views as the biblical precedent for how one successfully engages with cultures that are not your own. As the linchpin of his argument, he lays out two contrasting passages from the Acts of the Apostles. The first, Peter's preaching to the Judeans in Jerusalem in Acts chapter 2. The second, Paul's preaching to the Athenians on the Areopagus in Acts chapter 17. This was also odd, because, well, that's totally what I would do, too. It's exactly the right parallel. So far, Ken and I were two for two, and that in and of itself was a little freaky. I read on. As Ham describes it, Peter succeeds because the Jews that hear him share his culture and his knowledge of the texts of Torah. But Paul? As Ham initially describes Paul's engagement with the "Greeks," Paul is completely rejected. They scoff and laugh at Paul. He fails to reach them, because they don't have a basis of common understanding. This comparison is the fundamental groundwork for Ham's argument, and the basic tension of the book. To spread the Gospel, Ham suggests, we must "de-Greek" our listeners, relentlessly and aggressively tearing away all of their culture. Christians must obliterate the idea that science is valid. We must never compromise, or yield. For a while it seems like Ham's argument is that we must not fail to spread the Gospel as Paul failed to spread the Gospel. Ham assumes we will take him at his word, and not bother reading scripture ourselves. But here, being biblically literate helps, because Ham completely misrepresents Acts 17 read in its plainest meaning. Ham misses the point of Acts 17...and misrepresents the history of the spread of Christianity...so badly that it feels a mark of near-epic exegetical incompetence. Because while the Athenians do scoff and laugh in Acts 17:18, the story of Paul in Athens goes on. If you read the whole story, they then say, hey, we've not heard this freaky Jesus stuff before. They're interested. And then they invite Paul to tell them more, so he goes to Mars Hill to join other philosophers who are presenting new and interesting things. When Paul does so, he's not stupid about it. The Biblical account shows him both being respectful to Greek culture, using terms clearly recognizable from Greek philosophy, quoting Stoic philosopher/poets, and putting the message of Jesus in a form that was comprehensible to his listeners. From the basis of respectful dialogue that adapts the message of Jesus to a new culture, Paul interests some of them further. After a few more conversations, some of those Athenians choose to be Christian. That end result...Paul's successful culturally-relevant evangelism...is almost completely missing from Ham's interpretation. It was Paul's greatest gift. He knew how to find commonality. He knew how to bridge cultures and ways of understanding. The conclusion Ham draws, having danced his way around grasping the plain meaning of the text, is that what Paul was doing was the opposite of that. What is needed, Ham argues, is to double down on the same methodology that has been used by fundamentalism since this whole fundamentalist/modernist thing started. This works great with his presupposition, but it's materially, provably, and historically incorrect. The "Jewish" church that he presents as the equivalent of the bible-believing model we should all double down upon? It died. Ceased to be. The church that succeeded, that spread, that shared the message of Jesus with billions? It was the "Greeked" church. It was the church that adapted, that used whatever language, form, and understanding was necessary to share the message of the so-close-you-can-touch-it Kingdom of God that Jesus taught and incarnated. The very last thing evangelically minded Jesus folk need more of is aggressive argumentation in defense of rigidly held presuppositions. Where the message of Jesus stuck, it wasn't because of the bludgeoning of combative apologetics. It succeeded in non-Semitic cultures when those who proclaimed it lived out the message of Jesus they were articulating. The Gospel makes you live a different life, visibly and demonstrably. That was what changed souls in the Roman Empire. And in Korea. And in Japan. And in China today. It stands in tension with every culture, and speaks truth in ways that scripture illuminates, but that is also affirmed by the experience of every human society. Do we really need to accede to the self-evidently false idea of a universe that is 7,000 years old to grasp the idea of human suffering and brokenness, and the need for something radical to be remade in the human psyche? No. Clearly not. That the Gospel speaks powerfully to the essential experience of humankind has always, always, always been how evangelism has worked. The great strength of Christianity is that Christ's grace is gloriously adaptable, that it finds ways to work with the idioms of every culture. It is inherently universal and pancultural, integrating every truth that resonates with the Gospel into itself. The maddening thing about this little book is that it is exactly and utterly the opposite of what is needed. "Salvation made Relevant," or so the book claims. If we did what Ham has been doing for decades, and wants us to do now, the church would fail. It would fail as it has failed for a generation in Europe, and as it struggles in America now, as earnest but tone-deaf verbal clubbings from well-meaning but misguided Jesus folk drive hearers away. 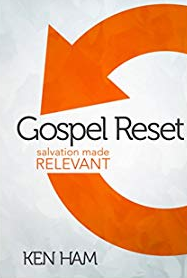 Even the title is misleading, because Ham suggests resetting nothing about how he approaches the Gospel. There is no awareness of the damage his theology does, and how easy it makes it for those who despise faith to cast Christians as willfully ignorant and faintly psychotic. There is nothing at all new here, other than the call to continue down a path that has driven millions of souls from the message of Jesus. In his conclusion, Ham recounts a conversation he has with a young atheist. He uses his method, aggressively presenting his apologetics, and getting that young atheist to understand that at the heart of their understandings of creation they have completely different foundations. And then he doesn't quite get around to describing what happens next. At the end of that story, that's it. There is no story of respect for Jesus instilled. No common ground established. Not even a seed of respect for Christ's compassion for the outcast planted. Just the creation of opposition, irreconcilable and fundamental. And this, this is meant to spread the Gospel? So. This "free gift" from Answers in Genesis? While I can appreciate the old axiom that you shouldn't look a gift horse in the mouth, I'm Greek enough to remember that didn't work out so well for the Trojans. I do not doubt that it is well-intended. But the road to irrelevance and evangelical failure is paved with such intentions.